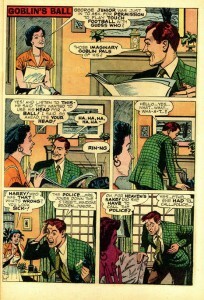 About a month ago I bought a collection of rough shaped old comics. The pile was mostly Charlton War, DC non hero and a hodgepodge of Dells. Hum hum stuff really but about half way through the pile I came across Tales from the Tomb #1, a true diamond on the ruff. It’s an awesome sensation coming across a book you know is special, especially when you really don’t expect it. All us collectors out there I’m sure have had this experience, rummaging through some old raddy stuff you’ve seen 100 times before and them bam! I knew right away that this book was destined for the Undervalued Spotlight. I’ve owned Tales from the Tomb #1 before, perhaps 5 or 6 years ago, I’m not sure what happened to it or how quickly it sold but I do remember it was a lot nicer than the one I just picked up, hope I got a good buck for it! Certain books just have that power, that allure, you know? It was silly but finding this comic was like winning a lottery, I felt like I made a big score (it has about a $12 Guide value). 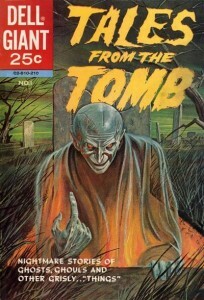 At 84 pages with a cover price of 25 cents Tales from the Tomb #1 is a Dell Giant, published a year after Dell Giants technically stopped their numbering sequence it is still collected as one of the must have Dell Giants. Dell Giants are of course those super wonderful and super cool Dell comic books that had a glorious run from 1949 (Christmas Parade #1 started it all) through 1961. They have their own section in the Overstreet Price Guide. The book boasts an awesome painted cover by Golden Age master L.B. Cole. Cole had just come to Dell as art director and editor a year before. 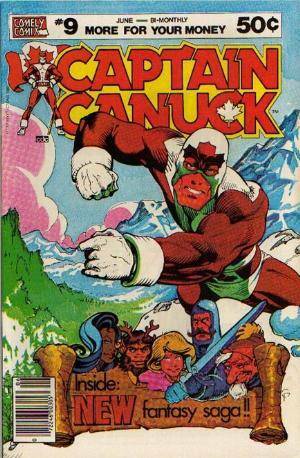 There are 13 stories in this comic, all are written by legend John Stanley. Stanley is more famous as a writer of satire/humor comics, his 1945 to 1959 run on Little Lulu is viewed by many as a high point in American comic book storytelling. These Little Lulu stories are mentioned in the same breath as Carl Bark’s Donald Duck run of roughly the same period. In the early 1960s Stanley did experiment with romance (1961’s Linda Lark series) and horror (this week’s Spotlight pick). 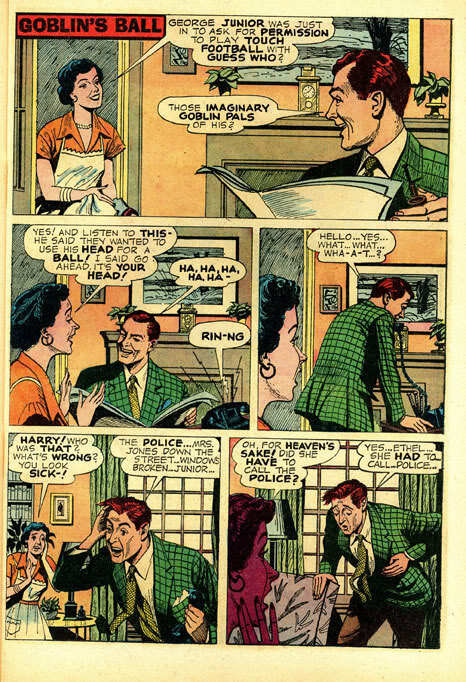 The stories range from single page gems like Goblin’s Ball (click on the picture to the right and enjoy) to as long as 13 pages like “Two for the Price of One”. All the stories are unique with delightful twists and surprise endings (my favorite is “R.I.P. and L.M.A.”). I envy the kid that was lucky enough to have a quarter and was insightful enough to pick this book up back in the fall of 1962. Tales from the Tomb is also one stubbornly tough book! Published in 1962, well before the collecting wave that arose in the mid to late 1960s. -A quick tangent!- It was a collecting wave mostly caused by Marvel Comics’ meteoric success. 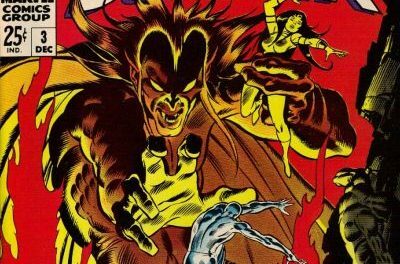 New fans to titles like Spider-Man and Fantastic Four started looking for the older issues they’d missed and inadvertently brought collecting out of the narrow niche and into a much more mainstream acceptance. This is one of the reasons why you see so many early Marvels at every convention you go to and why you don’t see any Tales from the Tomb #1s. As of this post there are only 4 CGC graded copies of this comic, 2 are at CGC 8.0 one at CGC 8.5 and the best graded copy at CGC 9.0. 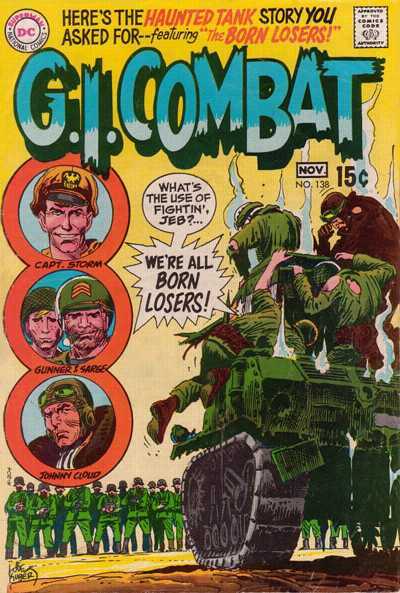 The CGC 8.5 copy sold for $250 in July of 2010. Tales from the Tomb is one of those books that people want but they don’t know it yet. All you have to do is get your hands on a nice copy and bring it to market. Cha-ching! The 41st edition of the Overstreet Price Guide shows $97/$194/$290 as the splits at the 8.0/9.0/9.2 grades. 13 John Stanley stories in one book! That cover is fantastic. You need to track down the original for your wall. Dell characters and features including Woody Woodpecker,Andy Panda,Tom and Jerry,Howdy Dowdy,etc. Are you absolutely sure that the cover is by L. B. Cole? Looking at his other work (and I admit I’m not too familiar with it), it doesn’t quite resemble this. Also, I just found some records that indicate that my father, John Schoenherr, painted a “Tales from the Tomb” cover in early 1962 – and the background of this one certainly looks like his work (he also did the cover for Dell’s SPACE MAN #3 at the same time). Anyway, any more info/evidence about this would be greatly appreciated!